Hello everyone! I have a special treat for you today! I have teamed up with Von2480 on YouTube! We are bringing you some New Years manis and pedis! She has some beautiful nail art ideas and amazing hauls on her channel. She doesn't just stop at nail art and hauls she also does makeup and reviews! You can check her channel out here. I love this! By now you guys know I do not care about "proper" colors for the season. I wear what makes me happy. I love pink and black! My all time favorite colors! Who wouldn't celebrate New Years with their favorite color on their nails?? I love the Icing glitter polish over the pink! Such a pretty combo! 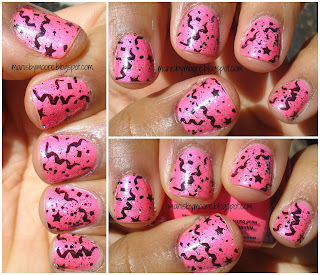 Make sure to check out Von2480's toe nail design! What are your favorite color's to wear on your nails for New Years?? Thanks for stopping by! Thank you so much!! I love your plates!! Very pretty. I love the pink. I totally agree! I paint my nails because it makes me happy!